#radonc Journal Club: Single vs Multifraction Radiation for Bone Metastasis - RadOnc Community! The lead author, Dr. Robert Olson, will be joining us for the live chat, scheduled Sunday 8/17 at 8PM Central Standard Time. You can follow him on Twitter at @DrOlsonOncology. T1. What is the role of RT in treating bone mets? T2. What was the purpose of this study? T3. Were the results of this study surprising? T4. What have we learned about improving palliative care for our patients? We would love your participation. Thank you in advance for joining us on our first journal club! Do you have any questions? If you have any suggestions on improvements, let us know. I’m glad that we’re discussing this paper – but also a little sad that it needs discussing! I would have thought thousands of patients in randomised trials, more than one meta-analysis, systematic reviews and a Cochrane review all concluding the same thing would have made the conversation redundant. The variations in single fraction prescribing described in this paper are huge in one geographic area of one country. We can too easily the variety in prescribing across the same continent or across the globe. These are not driven by different interpretations of the evidence – because the evidence is the same all over the world – they are driven by local, cultural and economic factors. We still don’t have strong evidence that a 5 or 10 fraction treatment serves the ‘good prognosis’ patient any better. Richard, thank you so much for your perspective. The study shows variability in practice patterns, which we also heard as a global issue from our discussion on Twitter. You make a good point about the factors at play. The advantage of this study is its ability to demonstrate it’s not just financial though obviously it is a factor in some parts of the world. It will be interesting to see what value these Twitter discussions have, but I suspect it will be of some use. 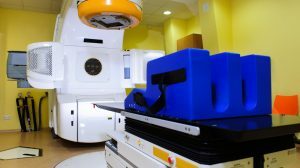 Your experience and testimony to the effectiveness of single fraction radiotherapy may help get that fraction number down for many.